The Black Granite hills on which you can find the ruins of some Buddhist and Jain structures known as Bodhikonda. 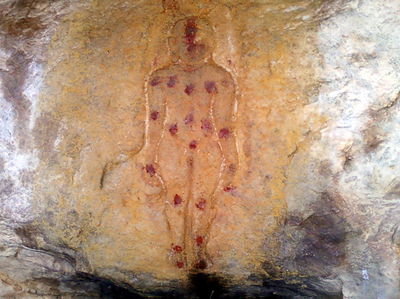 Apart from it there are two other hills by name Gurabaktakonda (Gurubhakthulakonda) and Ghani konda (also known as Durga Konda) on which you can find a 3rd-century BC Buddhist Monastic complex Remains and Rock-cut caves with Jain Tirthankara images on the walls of the caves.This Place has a Historical Importance as both the religions of Buddhism and jainism flourished temporarily over here. At this place also the Buddhists are shown to have had a prior settlement in a place now sacred to the Hindus. 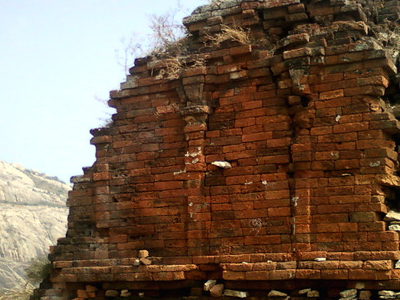 The central hill is known as the Gurabaktakonda (Gurubhakthulakonda) and it is high up on its northern side that the ruined Buddhist monastery stands. The hill is formed of precipitous bare solid rock, rounded on the top and about 500 feet in height. Near its south summit, under a vertical wall of rock is a perennial spring, beside which are a ruined brick mound and some Jaina images. On the rooky summit are some brick mounds. On the north face of the hill at a height of about 400 feet from the base is a long irregular rooky platform 903 feet in length and averaging more than 100 feet in breadth. The hill above it extends throughout its whole length in a vertical wall of rook about 100 feet high. Natural irregularities in the northern face of the platform have been made up by retaining walls of stone masonry. Along the whole platform is a series of brick mounds which were covered with dense jungle. 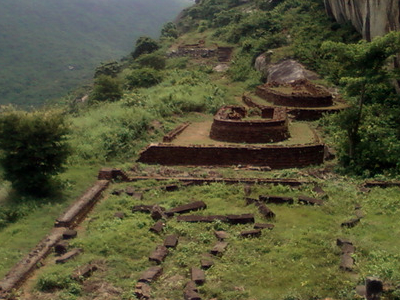 Excavations by the Archeological Survey of India yielded some more Remnants along these Ramateertham hills comprising Buddhist Relics and jaina Figures.This site is now under the maintenance of Archeological Survey of India, Hyderabad circle. The famous ancient temple of Ramachandra Swamy can be found over here. The beautiful idols of Lord Ramachandra Swamy, Sita and Lakshmana in Silver kavachas can be seen at this temple. There is a beautiful lake in vicinity of the temple. One has to visit this temple for its serenity. The festivals of Sri Ramanavami and Vaikuntha Ekadasi are celebrated with pomp and fervour here. You can see many tortoises with Vishnu Namams on their backs, roaming around in the temple. There is also a Rama Stambham installed by Pedda Jeeyar. Next to Ramatemple there is a Shiva temple constructed in 2007. The priest in the Shiva temple known as Guruvugaru or Rajeti Mallibabu is very spiritual and famous person as an astrologer. He is famous for curing many problems of health, family problems and uses tantric ways to solve everybody's problems. Goddess Shri Kamakshi in the Shiva temple is must see for everybody.There are a lot of religious activities which takes place in the Shiva temple for every full moon and during navaratri celebrations. Many devotees visit both the temples during important days. This place has lot of religious importance and is historial too. Here's the our members favorite photos of "Towns & Villages in Andhra Pradesh". Upload your photo of Ramateertham!